The regular Weekend Update will be posted before the open. Here's a few charts I've been working on here and there. This stuff isn't really fit for the general public (i.e.- my Minyanville articles), but I wanted to share them for the other technicians in the audience. Two of them are different/speculative interpretations of the market, one's just a monthly SPX chart. Comments and feedback would be very welcome! 1) It accounts for why this rally has felt like a C Wave, without introducing Minor (2)/(3) into the equation yet. 2) It would throw just about everyone for a loop. 3) It allows the SPX (et al) to travel down to 1000 +/- to bounce at the neckline and complete the head of a large daily/weekly (potential) head and shoulders top before we get the Minor (2) rally (see monthly chart). Okay, so that's three things, not a couple. The alternate count would run counter to my preferred long-term count, and change the red iv to B and the red iii to A. Your first chart definitely would throw everyone for a loop. And from an e-wave standpoint there it is certainly plausible. The biggest problem from me would be how to reconcile it with the NDX chart and also with my cycle work. Your alternate with iii as A and iv as B I like better because with the NDX so close to it's high it just seems like we are close to the culmination of a major counter-trend rally (either a '2' or a 'B'), and my cycle work suggests the same thing, that we are within a few days to a few weeks of a resumption of the bear trend. But the count you showed is certainly worth keeping in the back pocket IMHO. Just one thing to add in favor of the count you showed is that it could fit with current events. Let's say you got a scenario where you get a Greek default within days to weeks and that is the catalyst for wave 5 down of minor 1, but then Fed announces massive QE3 to create the minor 2 rally. Again it's good to have all plausible e-wave scenarios in one's back pocket and let the market tell us which one is playing out. Hey, wonderful to see someone posit something different. Believe it or not, I have two possibilities, and your wave 4 theory is one of them. Well done. My other theory, which completely flies in the face of all logic(which makes it so believable to me)would be that we are starting a MASSIVE 3rd wave up, and that the SPX and DOW are going to entirely new levels. Both the general, conventional bought and paid for media, AND the free thinking social media are pessimistic and downright apocalyptic. The perfect setting for a whole new era. Anon - Believe this or not, I actually have considered the same theory about a massive 3rd wave. Another option I've considered would be if the wave most (including myself) are labeling as B is actually (a), the recent decline is (b), and we are starting (c) of B, which would also lead to a massive rally. With this, I've considered that perhaps the liquidity would come from European investors. They have been fleeing the Euro banking system in droves, and some of that money is already finding its way into the market. So, contrary to the belief most hold that the situation in Europe is bearish for stocks, it may in fact, be bullish. Pretz, I'm part of the general public who you knew wouldn't understand your current post, but I am glad to read it anyway, especially as you encouraged me to ask my questions about it. Here they are. 1. Under your preferred count of the SPX in your first chart above, you would expect the SPX to fall soon to 1000+/- and then to rise to about what price? And then to fall some more to about where? 2. Under this other theory that you just replied to the other Anonymous person about, we would just go up for years with minor pullbacks along the way? 3. This may be a silly question for those who understand E Wave, but is it possible that both of these expectations are correct? I.e. we correct to 1000+/- during all this European turmoil, and then we start the big rally? 1) Are we at the Wave C of the ABC counter-trend rally? 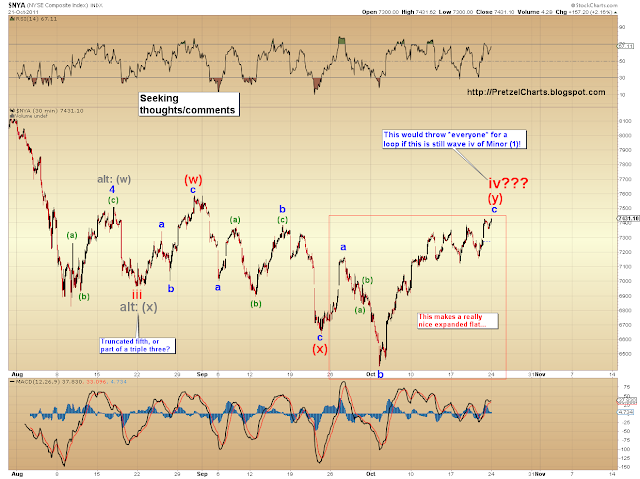 2) We might not have started Wave A yet of the counter-trend rally since we are still in Wave iv of the First Down Leg? If this is the scenario, this bear market is a lot more drawn out and painful than most can imagine in this generation. Correct? Thanks for doing the silver chart Pretzel, it'd be interesting to see the EW interpretation of silver. As for the massive third wave up, I find that a little hard to believe.... as each bull cycle is led by innovative new companies (in the 90s we had Cisco and later the Internet Boom), what do we have now? Only thing I can think of might be Cloud Computing or Social Media? What do you think? 1) Yes. 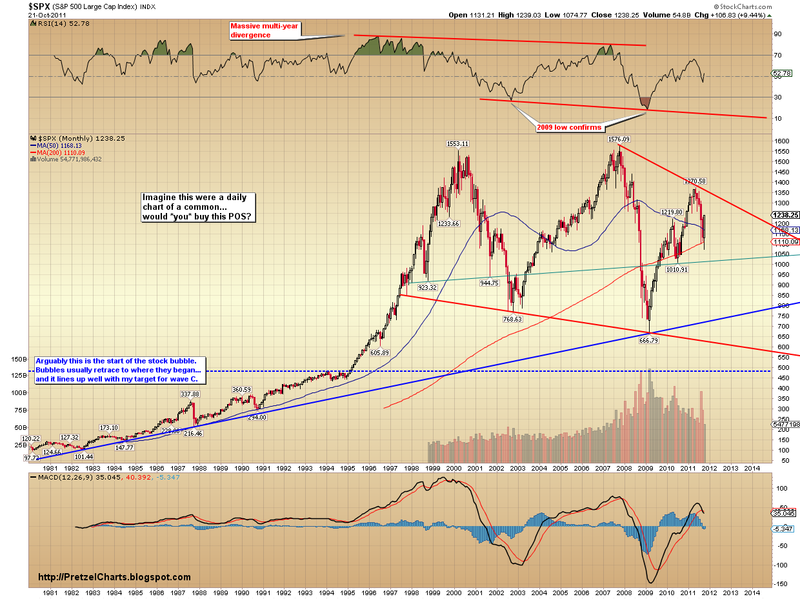 We would then rise in Minor (2), likely to retrace 40-60% of the entire decline. Future projections beyond that wouldn't change much, i.e.- wave (3) down would still be nasty. 2) Yes. Important to note this isn't my favored view at all. It's just something I'm keeping in the back of my mind in case my preferred view is spectacularly wrong. 3) That would be very highly unlikely... but not impossible. The wave structure of the decline and the subsequent rally should help guide us at that point. Sorry if these charts are confusing, they are not currently my preferred interpretations; just possibilities. Please don't take these as something other than they are. Wave A hasn't been discarded. I'll be updated my preferred counts later tonight or Sunday. It helps to remember that it's SUPPOSED to be somewhat confusing at this stage. If this is a 2nd wave rally, it's not supposed to be easy to predict how/where/and why it ends. Otherwise, there wouldn't be anyone to take the wrong side of the trade -- and that's where the majority need to be to get a large move in the other direction. 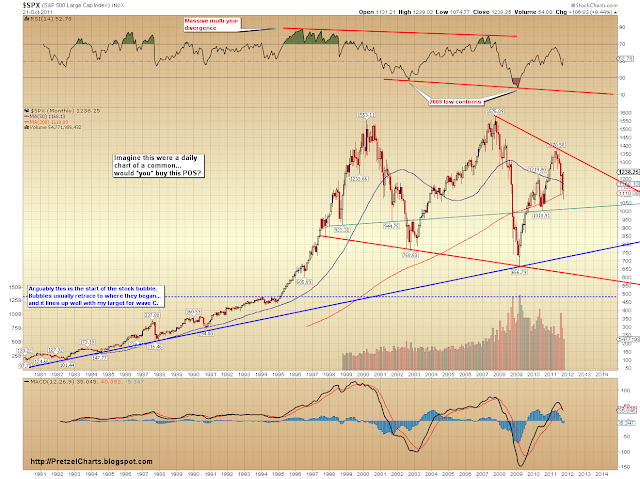 Regarding the third wave up: yes, I agree it is unlikely. It's important to remember, though, that the stock market, at its heart, is NOT driven by the economy -- it is driven by liquidity. When there is a lot of liquidity (which usually equates to a good economy, but not always -- read: QE1/QE2), stocks go up. When there's limited liquidity, they go down. The Europe situation *could* provide the liquidity for a bull market, if Europeans flood our market with money in an attempt to flee Euro-denominated assets. 3) This could simply be Wave iv of the the first wave down from Aug, meaning Wave v is around the corner to hammer SPX to 1000+- before the multi-month rally (A-B-C) wave kicks in in earnest by euro QE. 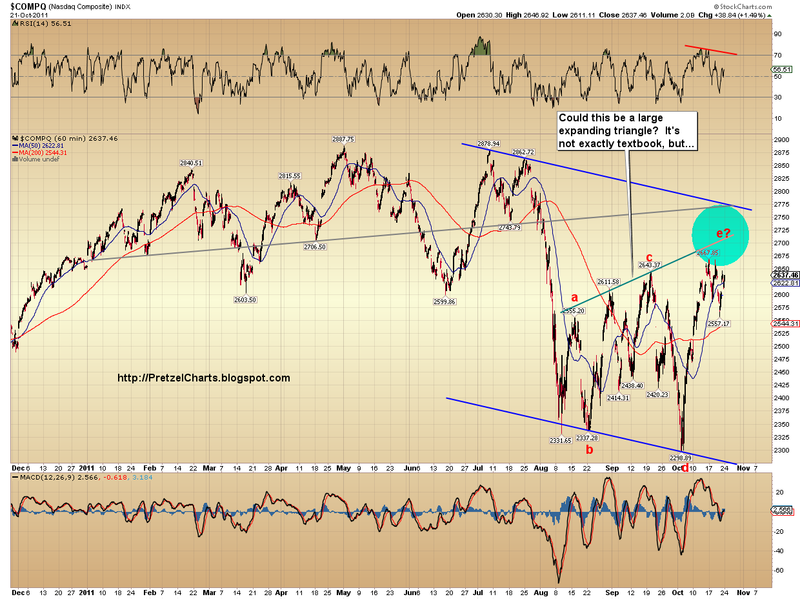 4) A massive Third Wave Up to clear SPX/DJI/NDX/COMP/RUT to new time (party??) because of massive Euro QE and potentially more US QE. I suppose if this is what happens I can imagine gold going over $2000 an ounce range. Any other scenarios in play here? I'm working on my weekend update, but yes, that's the gist of it. Sorry if it's a bit confusing or over-whelming, that's not my intention. I just think exploring other possibilities with an open mind is an important exercise to stay nimble in this market. Sideways markets like we've had leave a lot open to interpretation... once we start getting some clear impulse moves, things will clarify a bit and we'll be able to start taking some options off the table. Actually I like the fact that you are coming up with so many speculations for us to consider in real time. The market is never about absolute and always about possibility, and is mercurious by nature and can change on a dime. So one must be able to shift with the market with the objective evidence given at the moment. Market is never wrong, opinions often are. Keep up the good work! Thank you for all the beautiful charts. A little confused here. 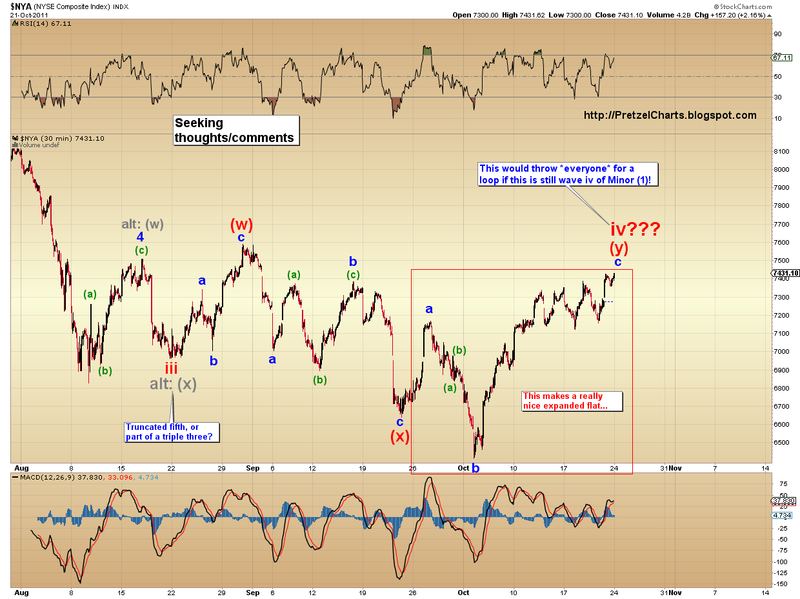 What is the preferred interpretation/ when should we expect a pullback? The Weekend Update, which I have not posted yet, will contain the preferred interpretation. Hey, Frank -- added your SLV chart to this blog post... it's the last chart. Thanks Pretzel for the SLV chart. 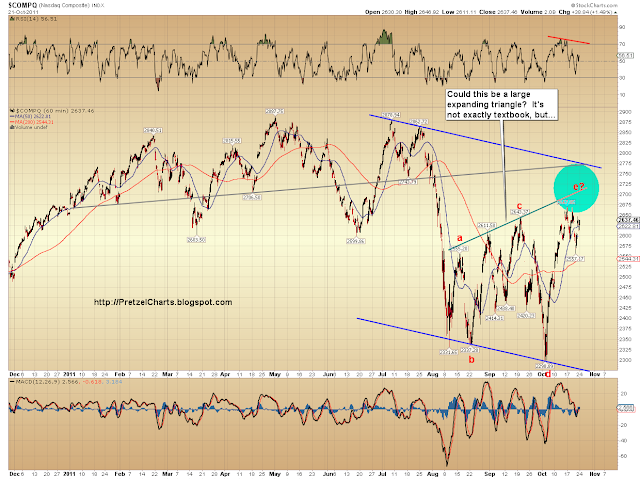 So SLV downward EW projection does confirm the strength of the dollar and the big picture SPX long term downward move. One thing to keep in mind w/ the target is that all slv technically has to do is exceed the bottom of wave iii at 27.41. So 26.12 is a likely target, but not the conservative, "safe" target. While the S&P doesn't appear to have entered it's B wave down the VIX definitely looks like it did when it tested resistance at the 50day MA on thursday morning and failed. Is it possible that instead of selling, people just bought VIX up as a hedge to complete the wave B down? It's like a derivative move for Elliott so I wasn't sure if it's something that can be considered or has ever occured in the past. In EWT, the price chart contains all the information you need; other indicators are used primarily to confirm or deny certain interpretations of that info. Does that answer your question? Yes, you're saying only direct price is measured in EWT...I just wasn't sure if moves can be hidden in derivatives like volatility or on longer terms through inflation adjusted nominal value. It's entirely possible that everyone was hedging with VIX while the *SPX* created its B wave (see update)... that's certainly not a bad speculation.